This most interesting surname is of Gaelic origin, and is the Anglicized form of the Gaelic "MacMaicin", which is composed of the Gaelic prefix "mac", son of, and the personal name "Maicin, Macain", from "mac", youth. 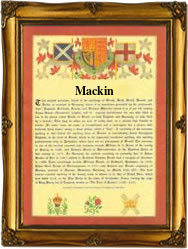 The MacMaicins were an Oriel sept and "Mackin" is their spelling of the name in County Monaghan, where it is chiefly found, while Macken is found in County Louth. There was also a sept of O'Maicin, O'Macain, containing the Gaelic prefix "O", male descendant of, and the same personal name as above, who were a Corca Laoidhe sept, prominent in South-West Cork. The surname appeared in Munster as O'Makan, O'Mackane, and O'Mackine at various dates from 1314 in the Justiciary Rolls, to 1600 in the Fiants. The Four Masters record the death of Thomas O'Maicin, Bishop of Leyney (in Connacht) in 1265, while one Leighlin Omakin is mentioned in an official report of 1360, as one of the Leinster enemies of the English king. James Macken was murdered at Hoggen Gate, Dublin, in 1567, and was a "hibernicius" (native Irish), as the official record tells us that his murderer was pardoned, though found guilty. Patrick Mackin, aged 23 yrs., a carpenter, was an Irish Famine immigrant who left Liverpool for New York on April 17th 1847. The first recorded spelling of the family name is shown to be that of Maeilbrighde O'Maicin, which was dated 1225, Abbot of Ballintubber, according to the Annals of Loch Ce, during the reign of Hugh "Craobhdhearg" (Red Hand), High King of Ireland in opposition to de Burgo (Norman Conqueror). Surnames became necessary when governments introduced personal taxation. In England this was known as Poll Tax. Throughout the centuries, surnames in every country have continued to "develop" often leading to astonishing variants of the original spelling.